Made in dark brown bridle leather, Swelled center browband rolled round to the head. Sterling plate in center of the browband has a 14 kt gold bucking horse overlay, and rounds have 3 3/4 inch sterling ferrules each side. 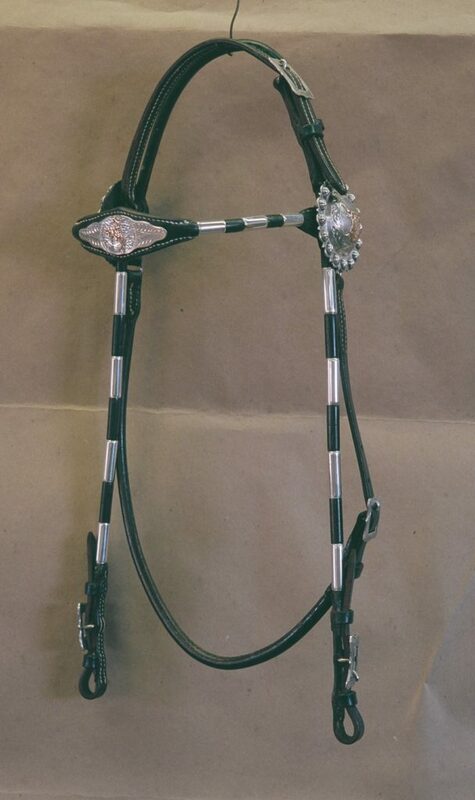 2 1/2 inch sterling conchos with bull head in 14 kt gold overlay at the browband. 3/4 inch No115 buckle left side of the head and 1/2 inch No. 115 buckles at the bit ends and throat latch. Rolled cheeks have long 1 1/4 inch sterling ferrules. This head stall can be made in Tan, Chestnut, and Black leather also.